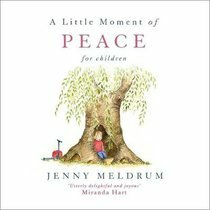 About "A Little Moment of Peace For Children"
Jenny Meldrum lives in Sussex with her husband, three children and Isla, her greedy black Labrador. She paints from her studio (posh word for shed) in her garden, eternally distracted by wild rabbits, moorhens, deer and a particularly pesky heron. Despite her love of art since childhood, Jenny had no formal training and began her career as an actress, only returning to painting when her own children were at school. She has since privately exhibited seascapes and views of the South Downs. In 2016 she illustrated Miranda Hart's book Peggy and Me.